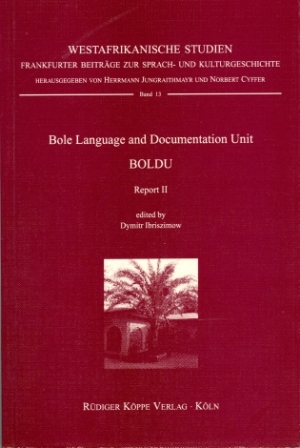 Following the first report of the working group BOLDU (Report I) on ethnological, ethno-linguistic and geographical areas of the Bole culture (volume 7 of this series, see link below), the BOLDU Report II is dedicated to the history of this Northern Nigerian people. For the first time, the history of the Bole (Girgam), written in Maghrebinian-Arabic, is represented in a facsimile reproduction of the original manuscript, an Arabic edition and a critical translation. Furthermore, the author offers a differentiated linguistic analysis and the comparison with further historical material. On the basis of these considerations, the author tries to date the manuscript and the terms of office of some rulers exactly. A thorough examination of the lists of kings offers new insights to the last 600 years of the Bole. A description of the fates of a side line of the reigning dynasty completes the first part of the study. Part II contains an important contribution on the history of the Fika emirate during 1903 and 1904. The focus lies on social and economic changes before and during the British colonial time. "Im Gegensatz zu zahlreichen anderen kleinen Völkern Nordnigerias, deren Geschichte nur rudimentär in oralen Traditionen zu erfassen ist, können im Fall der Bole auf der Grundlage der schriftlichen Quelle des Girgam historische Zusammenhänge erschlossen werden. Dem Herausgeber von BOLDU Report II ist für die sorgfältige Edition einer Version des Girgam zu danken. Darüber hinaus ist ihm gelungen, durch die gleichzeitige Veröffentlichung weiterer Beiträge über die Bole den Bogen der Geschichte bis in die Gegenwart zu spannen und damit eine sehr empfehlenswerte Publikation über das Volk der Bole zu schaffen."